I put the light box out, but this does NOT have to be done with light. My daughter just chose to do it this way. These were all purchased at the dollar store except the two cups on the left and right hand side. Those are translucent tiles that were purchased HERE The tray was also purchased from Dollar Tree. 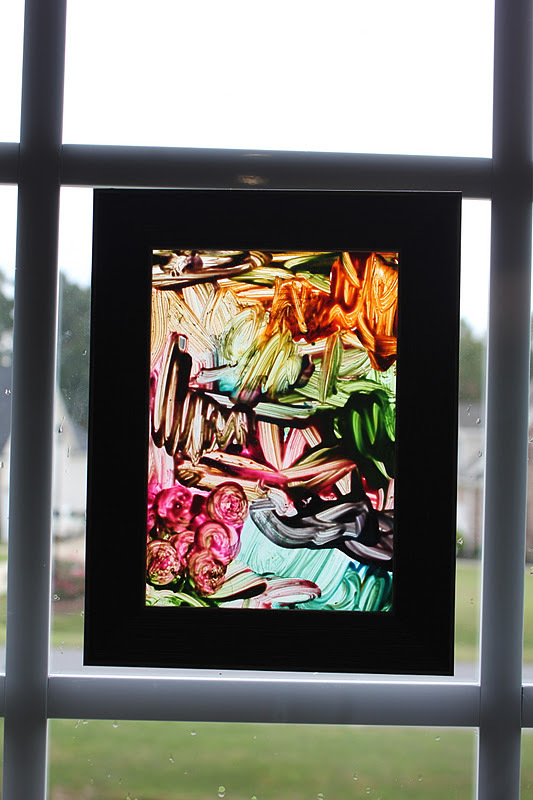 Take the backing off the picture frame and just leave the glass. We placed the gems on so you can see the front of the frame. However, if you want your objects behind or in front of the glass is up to you. For the gems we did them in FRONT of the glass. We did this for two reasons. 1. I wanted the girls to be able to feel/touch their creations. 2. The dollar store frames are not the thickest/best quality in the world. A few of the gems were bigger than the actual thickness of the frame. I wanted the hanging to be flat up against a window/wall. A few pictures down, you will see some leaves we did. Those are BEHIND the glass. Also, if you are going to hang them on the wall you can just leave the backing on if you don't want a see-trough effect. My daughter used a TON of glue. You do NOT need to use this much. The thinner the application the better the translucent result. Also, these were originally done with white elmers glue. A clear glue will give you the best result. She later on asked to use leaves. We didn't have any dried leaves handy so we ended up pulling these off one of the plants in the play room. If you use decoupage glue or modge podge it will work great with dried, pressed leaves. Not only will it preserve your leaves, but it would create a wonderful window hanging. When the leaves start changing color around here we definitely plan on doing this again! AK's son did this one. This was completely child guided. HE CHOSE to use the halloween gems. :-) Halloween gems were purchased at Michael's Craft Store. My 19M old daughter would rather paint... so we painted. This is acrylic paint. I superglued suction cups onto the back of the frame to hang them on the window. My daughter couldn't wait to hang them up! Clear Elmer's glue on left.... regular Elmer's glue on right. Big difference! Keep in mind the heavier the object you put on/the bigger the frame... the heavier the picture is going to be. You may have to adjust your hanging method. I'd love to do these as gifts for grandmas! How do you hang them up when they're done? what kind of glue did you use? Awesome idea! Apologies if this is obvious, but when the project is dry do you turn it or leave it? Is it the front or the back of the frame that everyone sees if it's hung on a wall? I'm so excited to try this with my toddler! Thanks for the idea! This looks like a great craft! I'm already thinking gifts for Grandma and Nana! @Erin.. We just used regular Elmers School Glue with the gems, etc. and Modge Podge with the leaves. @Crystal We did them so you can see the front of the frame. However, if you want your objects behind or in front of the glass is up to you. For the gems we did them in FRONT of the glass. We did this for two reasons. 1. I wanted the girls to be able to feel/touch their creations. 2. The dollar store frames are not the thickest/best quality in the world. A few of the gems were bigger than the actual thickness of the frame. I wanted the hanging to be flat up against a window/wall. The leaves we did so they would be BEHIND the glass. Hope that made sense! Where do you get your gems and translucent shapes. I have been looking everywhere and have not been able to find them. Thanks so much for your post! Love the idea and seems like a lot of fun!!! Will definitely try it soon. Have a great week! Thank you! I wasn't understanding how taking off the back would allow it to lay flat if placing gems behind the glass; it all makes sense now, thanks! How long did it take for the glue to dry? 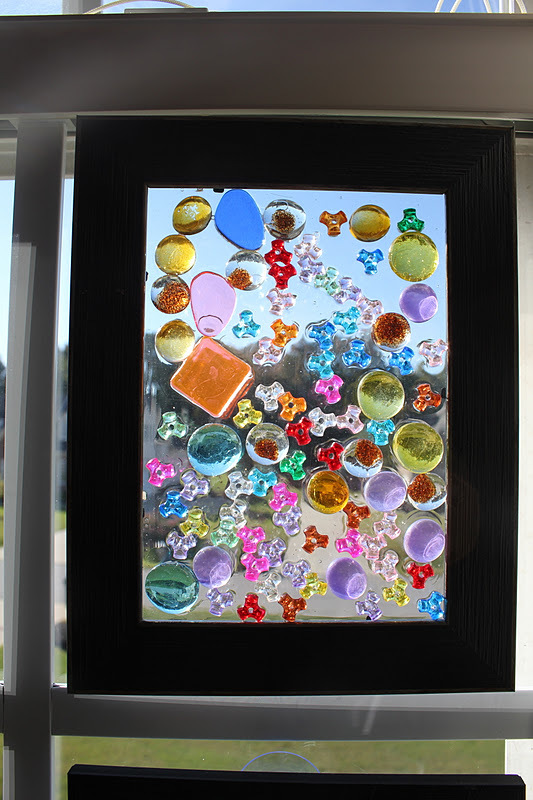 I ask because I did this last night to test before unleashing my toddler on this craft and found that the gems are not yet secured to the glass and its been over 6+ hours. I did not use a lot of glue, probably a 4th of what was used in your pictures above - a good layer but not enough to submerge the gems in. Did I use not enough? I also used an off brand of elmer's glue, could that be the problem? Or does it just take a really long time for the glue to set between the two smooth surfaces or the glass and gems? sorry for the 20 questions! lol THANK YOU!!! I did this with my boys yesterday and they loved it! With the exception of a small "glitter incident," it was very easy to clean up too. We are still waiting for them to dry completely but I think they are going to look awesome! I can not wait to do this! Love this idea! Can't wait to try it! 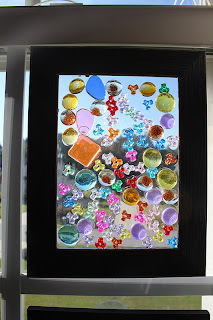 this is such a great project for my mom who LOVES sun catchers. 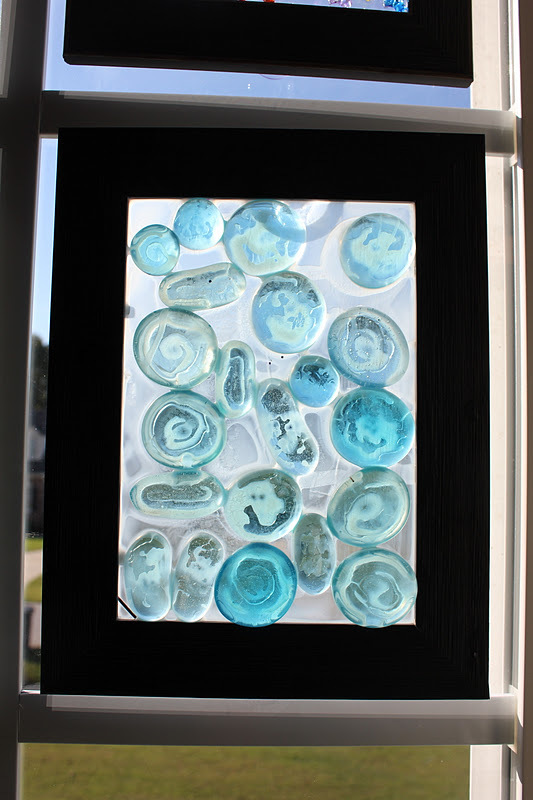 We planned on taking our 3yo to the corning museum of glass but at $19 for each of us to get in and $19 for him to make one... it seems a little crazy to spend over $60 (have to take him to lunch and momma is going to want to make something also) for a sun catcher. I LOVE it and can't wait to do this with my son. Do you think this would work with Modge Podge? It seems my Podge is multiplying and I don't have much regular glue. 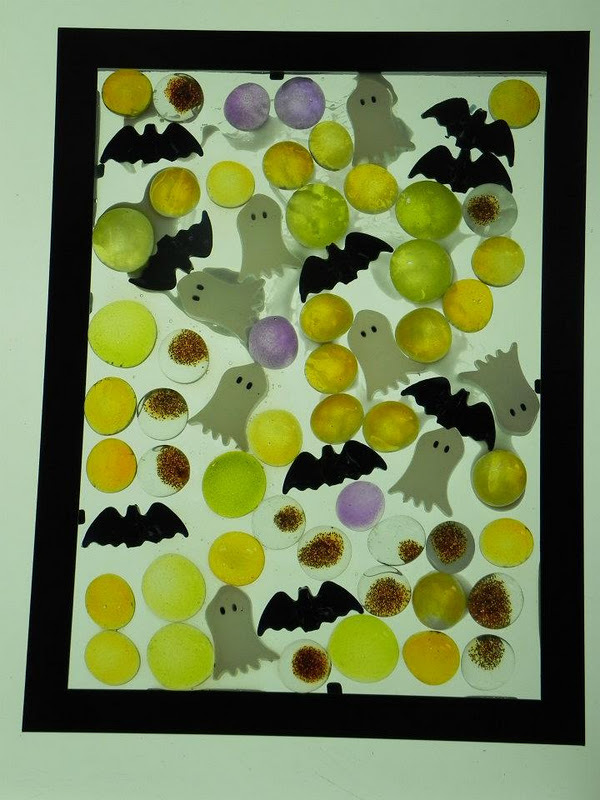 We did a very simple version of this using clear contact paper and torn bits of tissue paper. Our "frame" was just construction paper stuck to the contact paper. My almost-3-year-old loved tearing off tiny bits of tissue paper and sticking them to the contact paper. Then I just put another piece of clear contact paper over his creation and taped it to the window. Just showed these pics to my 4 year old son and he can't wait to do this for the grandma's for Christmas gifts! I imagine my 11 year old would love it just as much, it's always a bonus to find something they'd both enjoy! Loved the idea! Tried it with my preschoolers and used clear Elmers glue. Checked them today and sadly the edges are all peeling! Any ideas on how to save their beautiful creations? Just did one with glass "beads". My son loved it now we just have to dry the glue till we can hang them up. Will use acrylic gel next time. That makes sure that these creations last for a LOOOONG time. Great idea and thanks for sharing. Another ECE mom. We did this and my daughter LOVED it! It turned out absolutely beautiful! Just an idea, but we used dollar store window clings plus the glass pebbles. It's so pretty that we're making extras and sending them to my mom and dad for mothers and fathers day gifts! This is a wonderful idea! With the element of dollar constraints...I am thinking I need to use tissue paper squares, circles on the glass for framing up. Less weight! 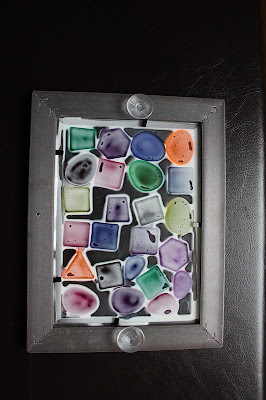 I love the glass pieces, I am thinking about doing this maybe for making a holiday gift! wow...awesome art. .. great job. .. is that your daughter???? thanks for sharing it to us..
OMG I absolutely love this! I'm not a crafty person, but I want to start trying this for my almost 1 year old - I've GOT to remember this one! Here's a nice way to lighten up your windows! This is definitely a must-try activity for kids. It's a good way to get their creative juices flowing while you bond with them. They all look cute on your windows, and the black border makes each piece stand out. 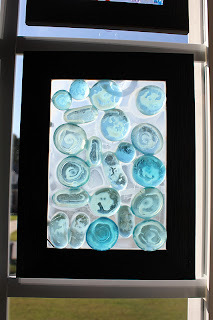 I like the idea of making window art! It’s a good activity to awaken the creativity in your kids. I’ll surely do this with my daughter this weekend! She’ll love this one too! I did this with my 3 year old last night. She loved it. We did it a little different, I'd like to post pictures but don't know how. Thanks for all the great ideas!